The term “design” on its own, is a broad term. In every field and industry, there is a need for design and designers. Designers draw inspiration from whatever they see, touch and, in the case of the textile designer, feel. I was from the fashion industry and had specialized in fashion management, but I surprised both myself and my peers when I started working as a PowerPoint designer for Chillibreeze, a PowerPoint design firm. Since both these fields involve design and I knew the basics of design, I was able to adapt to the requirements of my job quite fast. Going by what I trained in, industry-wise, I have moved away quite a bit. However, my knowledge in design has grown tremendously, and I have built a good career in Chillibreeze. In the graphic design world, there are no limitations to design. Yes, we do follow design trends. However, every brand has its own design style, and a designer must observe and learn to deliver what the brand needs. Graphic designers gather ideas from things that they see and observe. We do a lot of research on designs and study design trends. During one such study we picked 10 websites, and Chillibreeze designers looked at how they could incorporate design elements from there into PowerPoint. 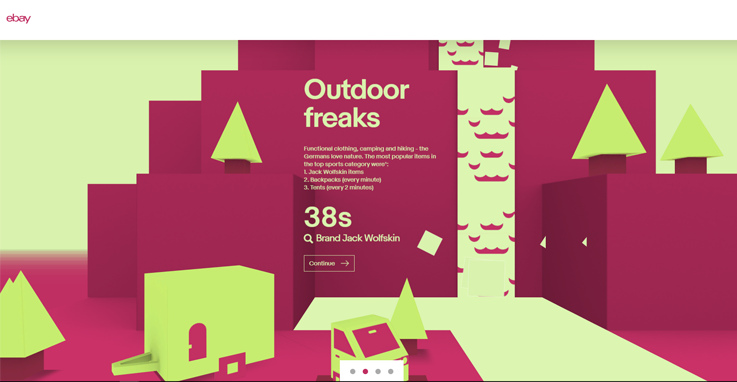 The German eBay survey report has interesting animations with 3D graphics that make their story interactive. When you scroll through the page, the animation unravels telling you the story. You can’t help but keep going back just to see what happens if the whole process is reversed. Hubert, a Chillibreeze PowerPoint designer, shared his observations and ideas after seeing this website. He says, the page uses very simple graphics that can easily be replicated in PowerPoint with the use of shapes such as rectangles, triangles, and freeform shapes. The animation too can be easily created in PowerPoint by using transitions with animation and timing them well. The graphics used by Insurance Experiments looks like it is taken straight out of a cartoon series. However, a PowerPoint designer can take a lot of ideas from the graphics and the animations used. The way the text is aligned and the usage of colors in the illustrations is enough to give several ideas to a PowerPoint designer. It was also interesting to see that most of the elements used on this website are already being used by our PowerPoint designers on customer files. Sissy, a team leader of the support team, made a few observations. She said, “the font used makes the website content easy to read and pleasing to the eye. The illustrations used are simple. The animations used on the website are simple, yet striking, and can easily be replicated on a PowerPoint deck using animations. Yohoho Studio has an interesting website that a PowerPoint designer can gather a few ideas from. It has a classic black, and white TV screen look with a touch of modern style. The website’s TV screen effect makes it very intriguing. The characters of the crew, their crafty way of introducing themselves with videos, and the descriptions will absolutely delight readers. The website is definitely engaging. Let us see what Andy (Chillibreeze PowerPoint Designer) has to say about the design aspect. Andy says, the website uses minimalistic design and simple transitions when moving from one page to the next. Their design is clean and straightforward. The use of black and white with bare minimum use of colors removes distractions. They use a lot of white space. A PowerPoint designer can definitely use transition styles similar to those used on the website. However, it might not be possible to create the glitch effect which is the most interesting aspect of the website. The new 3D feature now available on PowerPoint can be used to create interesting 3D designs. So, there are very few things out there that we cannot replicate! Geex Art is a web app developer, and you get a feel of their expertise on their website. The design aspect is very intriguing. Their web page scrolls to the right. Suresh, a Chillibreeze Manager, says, having bold text for headings is a new trend in graphic design. This can be applied to all type of digital graphics and even print copies. Chillibreeze customers have shown a preference for the kind of layout design used on this website, in their PowerPoint slides. It is essential to focus on content in any form of graphic design layout. This website shows some unique ways of text layout. The colors used on the page are modern and energetic. Good use of color contrast is necessary for graphic design. This is also applicable when designing PowerPoint slides. The use of animation on text here is a concept that PowerPoint designers can take away. Use animation on a PowerPoint slide to create a sequential flow of information to the audience. First parallel is a platform for building games on a smartphone. What’s interesting about the website is that you don’t scroll downwards but sideways. The parallax scrolling and placement of images gives an interesting effect. This can be incorporated into PowerPoint designs when you need to tell a short story by adding animation or transition. The website uses more of visuals and less content. It has a clean look and feel, which is what we are creating and delivering to our customers. The use of a circle with a ripple effect to draw attention and the opening of new content pages from clicks on the circle reduces clutter on the home page. This is an interesting idea that can be incorporated into PowerPoint design. The website ‘Funktional’ uses a Sci-Fi theme design which is very futuristic and eye catchy. They use minimalist designs which makes the page look clean. The pages have many images, yet the collage is very light and has breathing space. The design features of the website can be used to create exciting PowerPoint Cover templates. The font type/style selection and typography is a very important aspect to ensure you convey brands’ theme and message as intended. Funktional has done it exceedingly well. The website also uses a 3D model which can easily be created in PowerPoint with the new 3D model tool available now. Animation can be achieved using the transition tool in PowerPoint. So, there is plenty here that can be recreated in PowerPoint. Tux is a creative design company that works on branding, communication, production, media, and architecture. They brand themselves as a fearless partner in creativity. The design features used to design the webpage – placement of pictures, video, and texts in a simple yet effective way – can easily be incorporated into PowerPoint designs. The use of colors and fonts here along with the images give a retro look and feel, however, at one glance you can’t really tell what service or product the website is selling. The animations used can be easily incorporated into PowerPoint designs. Helicopter view is an acquisition company based in Europe. Just like the name itself, the website gives the impression of a helicopter view to its visitors. The design features of the website are clean and straightforward. When it comes to PowerPoint formatting and design, that is what most of our customers look for. Designs from this website can easily be created in PowerPoint. They use lines as design elements on the website, and that makes the visuals more realistic. The website uses subtle elements. Their choice of font/typography is very appealing to the eyes. The use of minimalist design makes the page look very clean. The colors used are very pleasant. It is always best to use fewer colors to bring more focus on content. The design should also align with business/products, personality, and emotion of the brand. The animation used on the website is simple. The site uses a float-in effect on all the images and text. That can easily be incorporated in PowerPoint Presentations also. The Hideout Lodge website use a straightforward and clean design. By the look of it, brown is their primary colour. They have it on their logo too. The first half uses white, and the lower part uses black and brown. The use of images on the homepage is good. However, the use of a line on top of the image does not give a clean look. The use of purple colour in the middle of the page is not really eye-catching. The use of icons on the website looks nice, but the line width is too thick. I find it diverts the eyes from the main content. Every element used on this website can be easily created in PowerPoint. What can be taken away from this website as learning is, the way it uses transparent designs on images. The font used is readable, but the colour brown is used heavily on almost every element of the pages. Equal Parts is a visual design studio that helps clients communicate visually. What is interesting about this website is that it uses hand-drawn graphics as its design elements. It looks childish, but at the same time, it gives a unique appeal to the website. Rubeena says that hand-drawn graphics’ look and feel can be incorporated into PowerPoint. However, if it is a corporate presentation, this design is not advisable. It would thus be correct to conclude that there are unlimited ways and resources for PowerPoint designers to draw inspiration from. Customers usually provide the designers with their brand style guide. The style guide helps keep designers on track when it comes to colors, brand style, and formats. However, it does not mean that designers cannot get creative without straying from a brand guide. Get this Cheat sheet for your style guide. Don’t let brand guides limit your imagination, rather make them the wind in your sail as you let your creativity soar skywards.